Jonathan Sarna is a Professor of American Jewish history. In this book, he deals with an episode which is apparently notorious among American Jews but which I never heard of before reading Sarna's account. 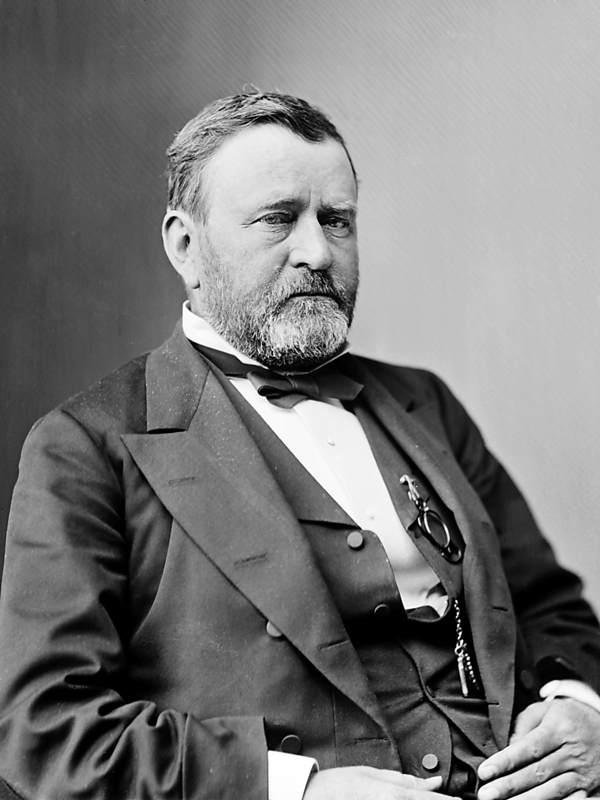 On December 17, 1862, General Ulysses S Grant issued “General Orders, No 11”, expelling Jews “as a class” from the so-called Department of Tennessee, a large area comprising the whole of Mississippi plus sections of Illinois, Kentucky and Tennessee proper. Jews were given 24 hours to evacuate Union-controlled territory within the Department on pain of imprisonment. The order was almost immediately rescinded by President Abraham Lincoln and therefore only affected a small number of Jewish citizens. However, being the most anti-Semitic decision ever made by an American official or military commander, it naturally shocked the Jewish community, which had expected the United States to be different from the European nations, where Jews faced various forms of discrimination and sometimes state-sanctioned violence. General Orders No 11 came back to haunt Grant in 1868, when he was the Republican nominee for the presidency. The Democratic Party and pro-Democratic and/or pro-Southern Jews naturally used the order against the Union war hero. Pro-Republican Jews tried to explain it away, not always successfully. In the end, most American Jews voted for Grant. They were not disappointed. Grant proved to be the most pro-Jewish president the United States had during the 19th century. One of his informal advisors was Jewish, he appointed more Jews to various positions in the federal administration than any of his predecessors, and he apologized several times to the Jewish community for having issued General Orders No 11. His policies were consistently secularist, which indirectly benefitted the Jewish population. Thus, Grant proposed the creation of federally funded public schools free from religious instruction. This created friction between Grant and many Catholics or evangelicals. The former wanted official recognition of their parochial schools, while many of the latter supported a constitutional amendment which would make the United States an explicitly Christian nation. When Grant appointed a new US ambassador to Romania, he chose the Jewish activist Benjamin Franklin Peixotto, whose sole activity was to promote the interests of the Romanian Jews, something he did with the explicit and official blessing of the president himself. One of Peixotto's goals was to encourage massive Jewish emigration from anti-Semitic Romania to the United States! Grant also protested through diplomatic channels when the Russian czar ordered thousands of Jews to leave the Russian-Romanian border area. On both points, Grant strayed from traditional US diplomacy, which was based on the principle on non-interference in other modern nations' internal affairs. (Note that Russia was a friendly nation, in fact an erstwhile ally to the Union during the Civil War.) Grant became the first “liberal” interventionist, arguing that US values on racial and ethnic matters were global. It's interesting to note that Grant's decision to appoint Pexiotto was influenced by the colorful Hassidic rabbi Haim Zvi Sneersohn, who was an activist for the creation of a Jewish state in Palestine long before Theodore Herzl. Ironically, Sneersohn criticized Grant's plan for massive Jewish migration to the US. He wanted the Romanian Jews to move to Palestine! Even more ironically, Sneersohn was later attacked (literally) by Jewish religious zealots in Tiberias who regarded his plan to re-establish Israel before the appearance of the Messiah as “heretical”. While “When General Grant Expelled the Jews” is interesting, I strongly suspect that it's really a political pamphlet. Sarna isn't simply talking about Ulysses Grant. He is telling us how an American president “should” act towards the Jews: apologize for past sins, appoint them to office, banish religion from the school system, promote immigration, protest the anti-Semitic practices of other nations and support Zionism. Sarna is presumably a liberal who believes that the interests of the Jewish community in America are best served by secular liberal presidents. Hence, his admiration for President Grant (who has been given a bad rap by 20th century historians, including some Jewish ones) and the attempts to rehabilitate him as the first modern liberal in the White House. My main problem with Sarna's book is that, frankly, it doesn't make much sense of the General Order itself. Indeed, Grant's decision to expel Jews “as a class” from the war zone seems to be the only anti-Semitic act he ever committed. Sarna points out that Grant was on a first name basis with the Jewish Seligman family already before the war, and remained on good terms with them throughout his life. Grant, certainly by 19th century standards, wasn't particularly anti-Jewish at all. Sarna admits that there was a context to the draconian General Orders No 11. Many smugglers and speculators in the war zone were Jewish. This is also how Grant explained the order later in life. It was a harsh decision made necessary by the military situation, neither more nor less. Sarna has a different explanation: Grant simply lost his temper after some Jewish smugglers tried to take advantage of his father. Just a few days earlier, Grant had rescinded a similar anti-Jewish order from another officer. This explanation makes one question both Grant's character and judgment. Somehow, Grant's own defense sounds more convincing. However, since Grant usually didn't attack Jews, it's clear that his order was unique. But if so, his pro-Jewish course later in life wasn't one long apology to the Jewish community, but the result of a long-standing conviction. This raises the issue why Sarna wants to paint Grant as a life-long penitent, as a “Haman” who became a “Mordecai”. Is that how he believes Gentile liberals should act in matters Jewish-related? It seems not even professors are immune to the SJW memes! Final point. The author says that American Jews in 1868 were faced with the following dilemma: should they vote for the party they believe was bad for the country (the Democrats) to stop a man who had been bad to the Jews (Grant) although his party (the Republicans) was good for the country as a whole? That is indeed an interesting question, especially given the line up in this year's presidential election. Liberal secularist Hillary Clinton is heavily subsidized by Saudi Arabia and promises an Obama third term, Barack Obama being the post-World War II president most critical of Israel. American First challenger Donald Trump is a hard line supporter of Israel, a friend of Benjamin Netanyahu, and an opponent of the nuclear deal with Iran. His daughter is a recent convert to Judaism and is said to be an admirer of Rebbe Menachem Mendel Schneerson, a member of the same Hassidic dynasty as Grant's activist friend. Yet, The Donald's movement is widely seen as racist and perhaps even anti-Semitic by established Jewish organizations, including AIPAC and ADL! It will be interesting to see how this plays itself out. Can American Jews tell the difference between Haman and Mordecai? And who *is* Haman in this year's election? That is the question.